Hello friend! Thank you for stopping by. I appreciate your visit. 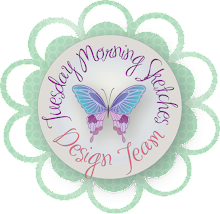 The latest challenge is up at Tuesday Morning Sketches and it's not a sketch. I decided there are so many techniques out there that I want to try that I thought maybe you'd enjoy the variety, too. 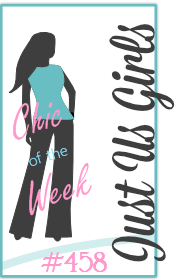 The Blank Canvas Challenge will be featured the last Tuesday of each month. 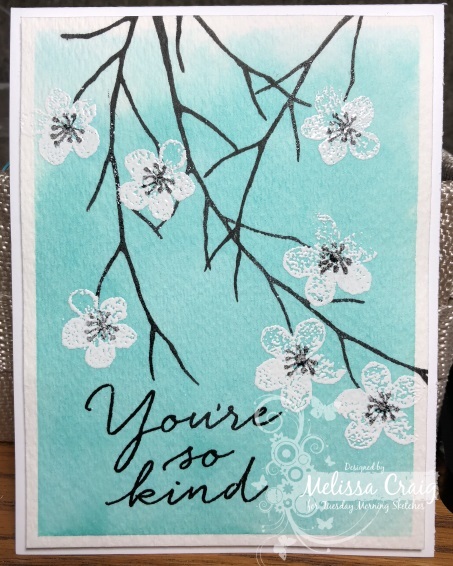 This week's blank canvas needs to feature watercolor, the color blue and make it a kindness card. My card features Beautiful Branches by Concord and 9th. I've had this set for awhile, I just haven't been able to use it yet. I did use watercolor paper and used Distress Ink to color the background. At least that's what I think I did. I made this card a few weeks ago and now I can't remember what I did. It might be diluting some color from a Zig marker. Anyway.... after it dried overnight I stamped the branches using VersaFine Black Onyx ink. I then stamped the flowers with VersaMark ink and heat embossed them using Nuvo white embossing powder. I then went back to the Black Onyx ink to stamp the details for the center of the flowers and used clear embossing powder. If you do this I totally recommend, if you try this, to use your MISTI or other stamp tool because the ink will slide on the already embossed flowers. The color isn't as vivid but still looks cool! I do hope you'll play along with us this week. If you don't do watercolor, don't sweat it! Join us anyway - use watercolor patterned paper. 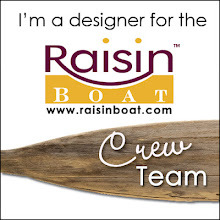 You simply must see what the team made, too! They are so awesome. Hello! Thank you for stopping by. I do appreciate your visit. 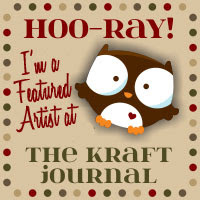 The latest sketch is up at Tuesday Morning Sketches and it's a very nice one by Janice. 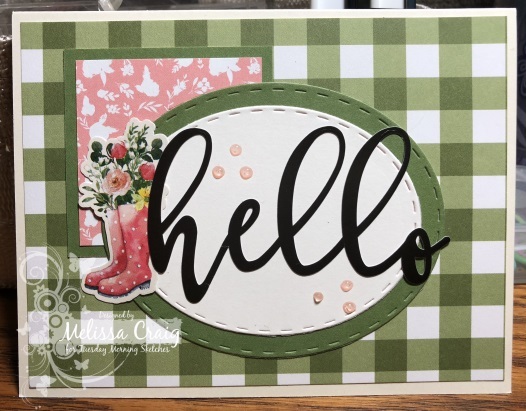 My card features the March 2018 Kit by Simon Says Stamp but there isn't a single stamp used! Nope, I finally used more of the elements that came in the kit - the papers and stickers. The only thing I added to this card was some Nuvo Jewel Drops. My second card I used Nuvo Crystal Drops and some twine. 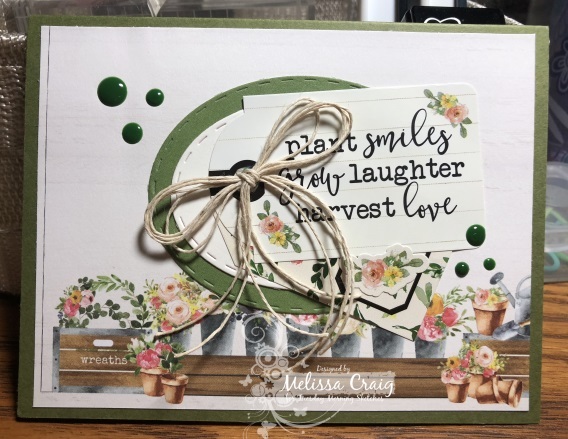 I love how they both turned out but it wasn't until I was done with them that I noticed I forgot the horizontal element in Janice's sketch - the first card it's obvious, the second card I could say I dropped it lower on the card by using the paper I did with the row of garden pots. But if I'm honest, that is a happy accident. These papers are so pretty that I picked up the digital paper pack for half off over the weekend. I still have plenty to use up, but now I won't run out. I really love this paper! Hi - well look here.... I haven't had two posts two days in a row in forever. But I'm excited that I finally get to play along with Pink and Main's challenge. I always discover them when they announce the winners! 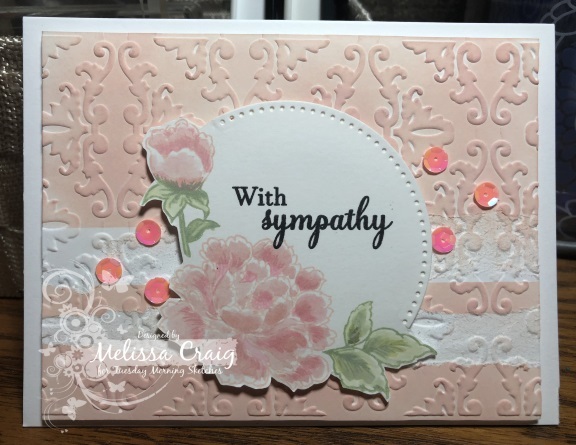 My card features Pink and Main's Inspire stamp set and Beach Bum paper. 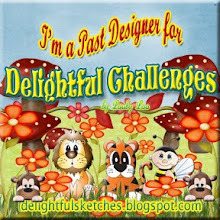 The challenge is Spring Theme and I can't think of much else than butterflies to remind me of Spring! 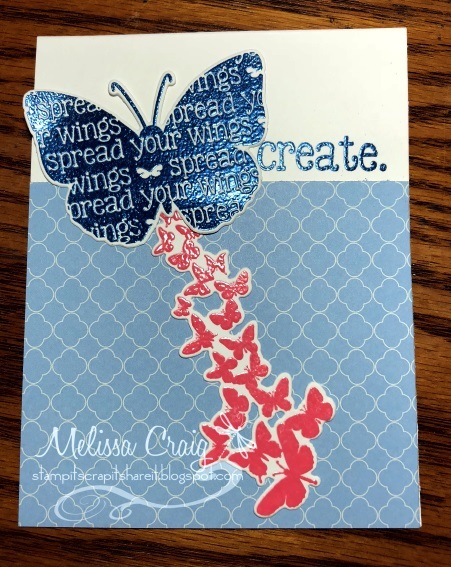 The larger butterfly and sentiment I embossed using Simon Says Stamp Steel Navy embossing powder. 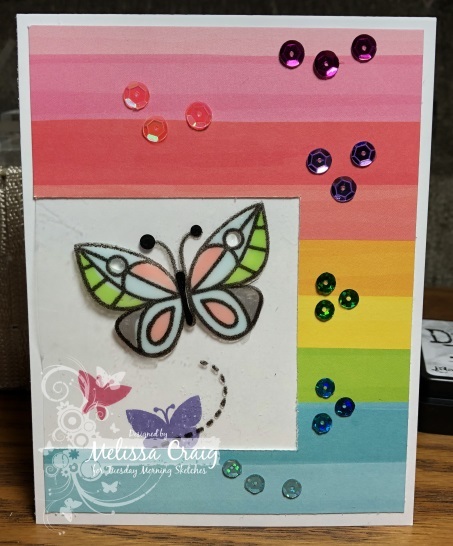 The smaller butterflies I stamped using Distress Oxide Worn Lipstick ink and then over-stamped the image with VersaMark embossing ink and embossed with clear embossing powder. I did have to doctor the picture a bit so it's brighter. It's night-time and the original picture is hideous. Hello! Thank you for stopping by. I do appreciate your visit. The latest sketch is up at Tuesday Morning Sketches and it's a super easy one. It's another blank canvas with easy elements. 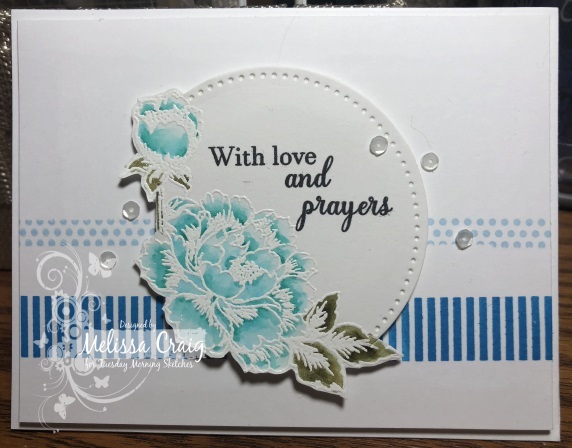 My card features the Stippled Flowers by Gina K Designs. My sister gifted me with this stamp set as well as the Wreath Builder set which was part of Gina K's release last month. So I found this set rather challenging to use, but in the end, I made two cards and I'm pretty happy with them both. The first card I white heat embossed the images using Nuvo white embossing powder on Bristol Smooth cardstock. I colored the image using Zig Clean Color Real Brush markers and a water brush. I then layered the circle dies and partially cut out the circle and fussy cut the rest. The horizontal images are from a Washi Patterns by MFT Stamps. I finished it off with some tiny sequins from Pretty Pink Posh. My second card, which was actually my first attempt which my sister encouraged me to make the card. I'm not real happy with this but she thought it was pretty. For this card I stamped the images using Distress Oxide inks in Tattered Rose and Bundled Sage. I then tried to blend in the color but it wasn't moving very well. I think I should have used watercolor paper, maybe?? So I tried adding some detail with the Zig markers again. It's... meh. I embossed the panel with Fleur di lis embossing folder and then colored the panel with Tattered Rose. Oh! Here's not what to do - turned mistake creative opportunity. I put down washi tape to mask off the horizontal lines. Then embossed and then did the ink blend. The washi tape became permanent under the pressure of the embossing so when I attempted to pull it off, it tore my panel. But I actually liked the distress is left behind. So I went with it. I don't know why the sequins look like hot pink in this photo, they actually match the ink color very well in real life.